This wearable powered by Android Lollipop aims kids aged between 6 and 10, bringing together a GPS tracker and a standard 3G smartwatch. Since kids usually break handsets much easier than adults, bringing together a 3G smartwatch and a wearable GPS tracker is an excellent idea. 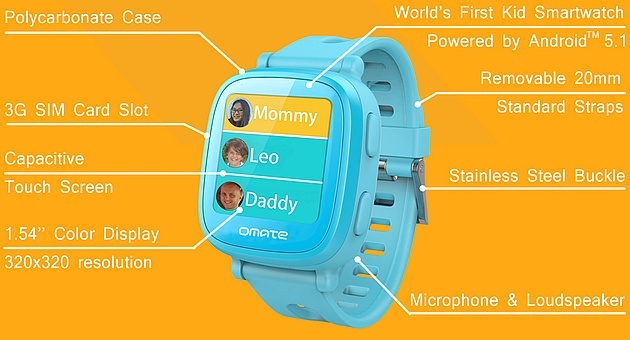 Omate is a company that has just unveiled such a device, namely the Wherecom K3 smartwatch for kids. Omate Wherecom K3 has a polycarbonate case and uses removable standard straps. Its operating system has the exclusive Wherecom UI on top of Android, including preinstalled apps for kids such as games, calculator, stopwatch, and more. This smart wearable will hit the market in April 2016 via Omate distributors, priced at $129 USD (unlocked). Monitoring services will go live two months later.